He's been called the next Hitchcock and a talentless hack. After M. Night Shyamalan exploded on the movie scene with The Sixth Sense there haven't been many more polarizing writer/directors out there. With The Last Airbender upon us, we thought it was a good time to go back and revisit what many consider to be his finest work. Samuel L. Jackson and Bruce Willis are fantastic as the opposite ends of the hero/villain spectrum. 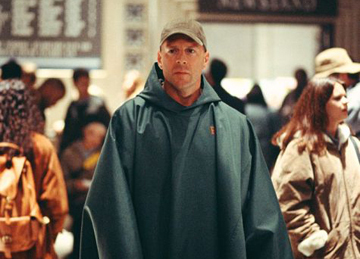 While no one knows whether or not we'll ever get the much talked about sequel, right now it's time to see how well you know Unbreakable.